Time flies! We promised to touch base every month – so let’s get right into what we’ve been working on! András has been having his fair share of CAD-filled days lately, and as a result we’re days away from sending the design of the case off to manufacturing. He’s made a million little tweaks and a couple of more significant changes. The fixation mechanism of the feet is definitely a major one. We brainstormed foot design ideas for a while, and finally found the best option. To keep the UHK as compact as possible, it will feature adjustable (flip open) feet that are entirely removable in addition to the small, flat rubber feet. This way if you decide not to use the adjustable feet, they won’t occupy any extra space. And if you do want them, they can be easily installed with 3 screws per foot. Once you do, you’re able to flip them open in a moment. The current design allows for positive tiling, negative tilting, and tenting – The best of every world! András has yet to finish the design of the adjustable feet so stay tuned for more news. We’re also stoked about having added pins for LEDs and Matias switches! We use universal switch footprints that combine the pins of Cherry switches (optionally with fixation pins), Matias switches, and LEDs. We designed the stiffening ribs of the bottom case in a future proof manner by routing them around the hybrid switch footprints to avoid mechanical interference. Please note that we won’t be able provide either an LED, or a Matias UHK version for a while, but the opportunity will be there for modders. You can see the pins on the following section view. Funny thing is, poor András has been working day and night to implement this seemingly small change, as it affected the geometry of the CAD model in major ways. He definitely deserves a day off… only to work even harder as we march towards manufacturing! Speaking of the above, I’ve created a dedicated layouts and keycaps FAQ page on our site lately, and while being there also spruced up the main FAQ quite a bit to satisfy your endless curiosity. In our previous update we were looking for a firmware developer to port our existing firmware to NXP’s Kinetis platform and develop it further. We’ve been getting quite a few impressive applications and suggestions. Say hi to Mr. Jan Rychter, who has been eager to help us, and offer his very valuable advice. Since first contact we’ve been exchanging emails full of geek talk. And did I mention that he’s also a most esteemed backer of the UHK? Jan got me up to speed in no time. As it turned out, Teensyduino is not the best foundation for a serious firmware application. It’s nice for prototyping purposes but NXP’s sophisticated Kinetis SDK is a much better platform for this purpose. Unfortunately, the MK20DX256VLH7 processor that we originally planned to use is not a good choice because KSDK won’t ever target it. As crazy as it might seem, there’s a more powerful, fully supported, and cheaper alternative on the market: the MK22FN512VLH12. How powerful and cheap, you ask? Let’s compare! Mind blown. Twice the power for less price? I’ll take that on any day of the week! Right now, there are a couple FRDM development boards on my table, one of which running our Kinetis firmware port which enumerates as a keyboard + mouse USB device. This is already looking great, and you can expect further major progress shortly, so the port is definitely within reach, and I’m happy taking this direction. You’re welcome to check out Agent in the browser. Please note that there’s only a minimal UX code behind the UI, but it should give you a good idea about the final interface. Thanks for reading, and talk to you on 2016-03-17! A fully programmable, impeccably built, open source, split mechanical keyboard designed for extreme productivity and ergonomics. I cannot describe how excited I am about this keyboard. Really looking forward to getting my hands on one of these. Great job guys! Thanks Priyendra, we totally share your excitement! What is the X-key-Rollover value for your keyboard? The UHK implements 64 key rollover over USB. 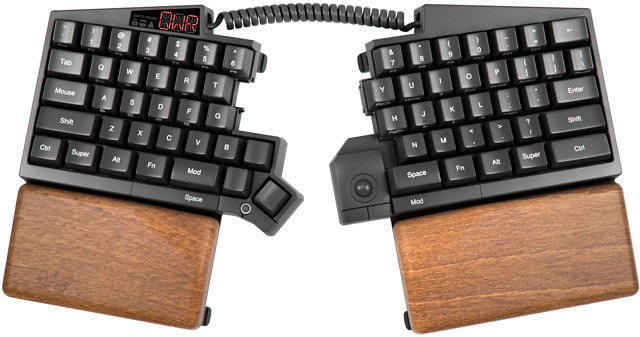 I completely understand how Mattias switches would be too much to add to the manufacturing options right now but have you considered an unassembled version that doesn't include switches or keycaps? Would get the modder audience (and this guy) stoked. We pride ourselves on being modder friendly, and as such we already offer your suggested version. Please let me get in touch with you shortly via email.